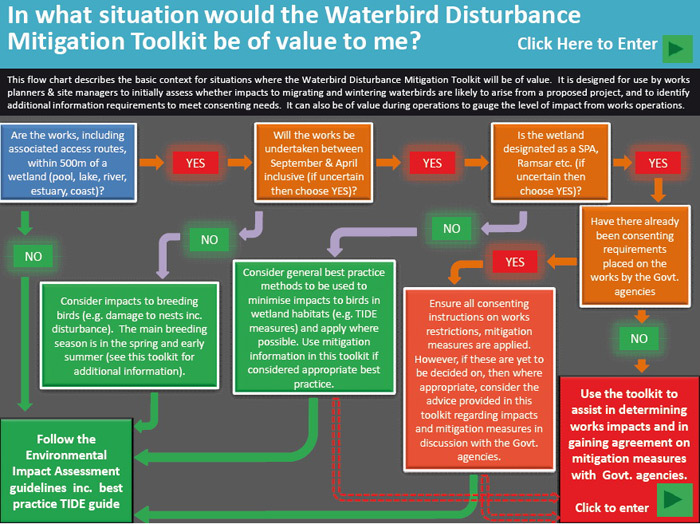 The Waterbird Disturbance Toolkit has been designed to provide a process whereby the level of potential disturbance to waterbirds from a range of construction activities on or adjacent to wetland systems can be assessed. The document is particularly of value for Natura 2000 sites and provides context on differing disturbance sources (noise & visuals), thresholds of effect, sensitivity variables, source variables, key species responses and mitigation measures. The document uses a PowerPoint platform to sequentially lead the reader through a series of information pages which help characterise likely disturbance levels from a range of construction activities and to assist in the provision of mitigation. In addition, a series of hyperlinks are provided to jump directly to key topic areas as well as external information sources. The toolkit is designed primarily to assist developers, managers, planners and statutory agencies identify the disturbance potential of a scheme of works adjacent to or on an estuarine system, in particular a Natura 2000 site, and to identify mitigation measures. Figure 1 provides an initial entry point within the Toolkit to assist a potential user in determining whether the tool will be of value. Importantly, this tool is not designed to replace traditional methods of environmental assessment and monitoring, but to provide an initial high level guidance in the identification of possible construction:waterfowl disturbance issues and assist in the development of appropriate mitigation methods where practicable. The toolkit can be used in conjunction with the Waterbird Disturbance & Mitigation Toolkit Android App which is available from Google Play. Important: You must have PowerPoint installed to open the PowerPoint version.